Here, in 75 minutes, is the complete history of the madrigal! Well, not quite – there are gaps here, but the King's Singers have assembled a survey which is both instructive and entertaining. The madrigal probably originated in Italy in the 1300s (probably as a derivation of the French polyphonic chanson), but its heyday was in the 1500s and early 1600s. It was a vocal work, accompanied or unaccompanied, in which a secular text was sung by a number of voices. Most madrigals had four or five voice-parts; some had as many as ten, however, and a few had fewer than four. As the madrigal matured and the texts in fashion at that time became more emotionally intense, the music itself become more dramatic and chromatic. The form traveled all over Europe, and became particularly popular in England, where an accompanied variation of the madrigal, the lute song, took hold around the time of Shakespeare. The King's Singers recorded this program in 1983. In the booklet notes, they express their gratitude to Anthony Rooley "for his help with the choice of repertoire." The all-male line-up is two countertenors, one tenor, two baritones, and one bass. The original King's Singers all were former members of King's College Choir in Cambridge, England. I don't know if this still was true in 1983, but the discipline and precision of this group remain a given. They're so good at what they do, and so distinctive, however, that sometimes we spend more time listening to them than to the music. (I call this the "Dietrich Fischer-Dieskau Syndrome.") I could probably identify a King's Singers performance in less than three notes. Now this is not a bad thing, but be aware that these performances are not as self-effacing as they might be, no matter how entertaining and technically accomplished they are. 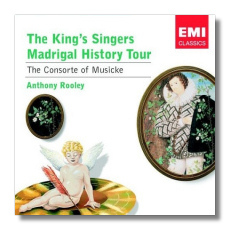 Rooley's Consort of Musicke provides apposite and agreeable accompaniments. This CD is in EMI Classics' budget-priced "Encore" series, so there are no texts. This doesn't matter much with the English works – the performers' diction is miraculous – but it is problematic when the texts are in a different language. (Three of the eight booklet panels are devoted to artwork and to advertising other Encore releases.) The engineering is top-drawer.